For the Chocolate Cookies: make separately. For the Vanilla Cookies: make separately. Preheat oven to 350°. Line a baking sheet with a Silpat Non-Stick Baking Mat or parchment paper. Combine flour, cocoa, baking soda and salt; gradually blend into creamed mixture. Set aside while you make the Vanilla Cookies. Beat together the butter, shortening, brown sugar, and granulated sugar until creamy. Add the eggs one at a time, mixing well in between additions. Add vanilla, baking soda, flour, and mix well. Set aside. To form the cookies, take a heaping teaspoon-size ball of chocolate dough (about 1” diameter) and flatten it out slightly with your hands. Combine the red and green sprinkles in a small bowl. Roll the edges of the cookie dough in the red and green sprinkles. Place the dough on a cookie sheet about 2 inches apart. Then take a scant teaspoon-size ball of vanilla dough (about ½” diameter) and flatten it out slightly, then place it on top of the chocolate cookie dough. You should still be able to see the chocolate dough on the edges, like in the picture above. Decorate the top of the vanilla cookie dough with the red and green colored morsels and bake for 6 minutes. 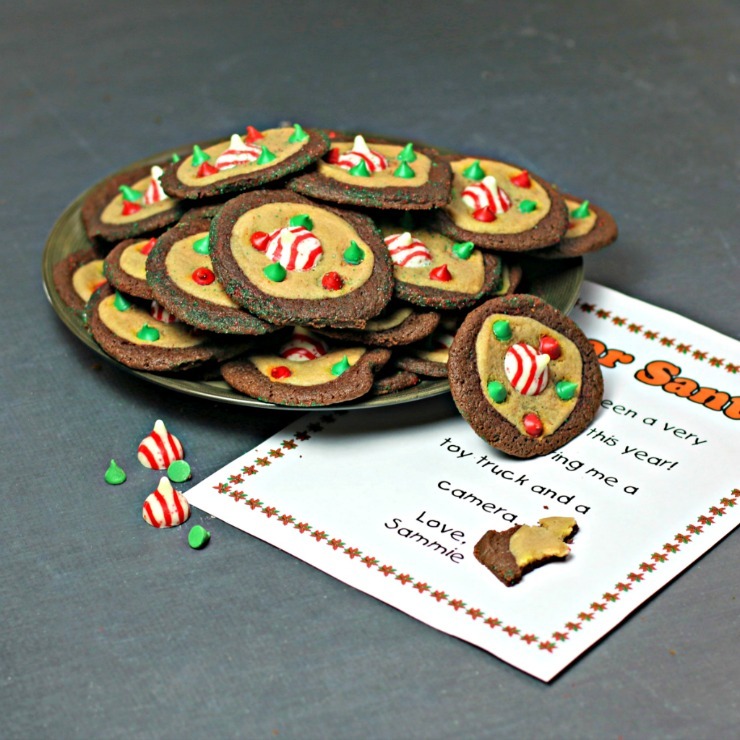 Take out the cookies and place the candy cane kiss in the center. Bake for another 2 minutes. Remove the cookies and let cool completely on the cookie sheet. Enjoy with Milk! 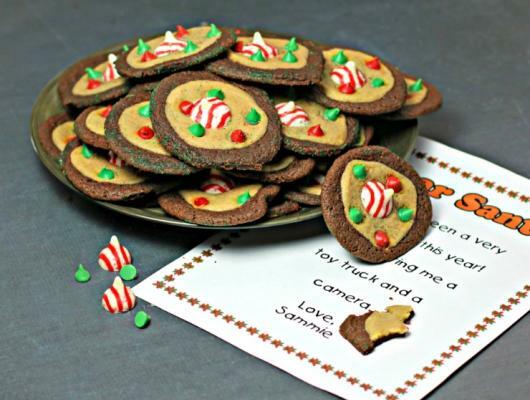 Whimsical Santa Cookies are kids in the kitchen fun cookies with two different kinds of delicious, buttery cookie dough’s. Don’t forget the letter to Santa!